Remarriage in the later years of life is not as uncommon as it once was. As people are living longer and healthier lives, people are more willing to enter into new marriages post-retirement. While this situation is great personally, it can create issues from an estate planning perspective. Children born in the first marriage create legitimate concerns about protecting their potential inheritance of their parent’s estate. In addition, long-term care is a looming issue for seniors, and if nursing home care is needed at some point, the income/assets of the new spouse will be included in the Medicaid qualification process. Basically, remarriage at an older age requires more attention to the legal ramifications that young newlyweds can usually ignore. The legal rights and obligations created by a subsequent marriage have immediate and lasting implications that can disrupt and complicate a person’s financial legacy unless certain steps are taken. A discussion of what could happen if no special precautions are made in one’s estate planning, and some methods to protect one’s assets from the unintended consequences of a new marriage, are discussed below. The main concern of many people entering second marriages is ensuring that their assets will still pass to their children, and not the new spouse. There are two issues in Florida law that could upend this intent: a spouse’s elective share and his/her homestead rights. 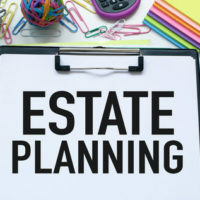 Under Florida law, even with a Will that leaves everything to one’s children, a surviving spouse will nevertheless still be entitled to 30 percent of their deceased spouse’s “elective estate.” The elective estate includes assets that go through probate and many non-probate assets, such as trusts, the cash value of life insurance policies, retirement accounts, annuities and payable-on-death accounts. Essentially, all the assets that have designated beneficiaries, that are protected from most other claims, are still subject to this provision. The children may received these assets directly, as the designated beneficiaries, but may still have to rebate a portion of what they have received to the surviving spouse. Thus, this complex issue cannot be ignored, and traditional asset protection methods, like trusts, are not sufficient to negate a spouse’s elective share. upon death, and in addition to the elective share, the surviving spouse is entitled to stay in the residence for rest of his or her life. Alternatively, the surviving spouse can choose to agree to allow a sale of the property, and to receive one-half of the proceeds, with the decedent’s children receiving the balance. Homestead and elective share rights are independent of one another, and a surviving spouse is entitled to exercise both options unless arrangements to negate this possibility are made in advance. Qualifying for Medicaid assistance to help pay the cost of long term care is another consideration that older couples looking at a second marriage need to address. While spouses are not personally obligated to pay each other’s medical bills, the Department of Children and Families, the Florida agency in charge of Medicaid for the State, will factor in a spouse’s assets when determining if the other spouse will qualifies for Medicaid assistance. While there are ways around this dilemma even after marriage, an elder law attorney with estate planning and asset protection experience should be consulted as to how to avoid this situation as early as possible. The most effective way to address the issues discussed above is to execute a pre- or post- nuptial agreement that waives a spouse’s homestead and elective share rights. Agreements of this type are complex, and must take into account a number of regulations in order to ensure the parties’ intents are enforceable. Consultation with an experienced attorney over how to draft these agreements is essential to their legal effectiveness. Marriages later in life can be wonderful experiences, but financial planning needs to be part of this process so other family members do not lose important rights. The law firm of William Rambaum, P.A. specializes in elder law issues, and can offer a comprehensive assessment and approach to your estate planning needs at this stage in your life. If you live in the Oldsmar or Clearwater area, contact his office to learn how he can secure your present financial needs and protect the financial security of your descendants.